Is the US a secretly socialist nation? If asked about the economic politics of the US, you’ll probably think of them as relatively conservative, right-wing, and capitalist. You hear of the richer becoming richer, and a growing underclass of the very poor who do not have access to any sort of financial safety net. To accompany this lack of social benefit, you hear of how wealthy, successful people are attracted to the US because of their favourable tax systems. That may not be true. This graph paints a very different story. 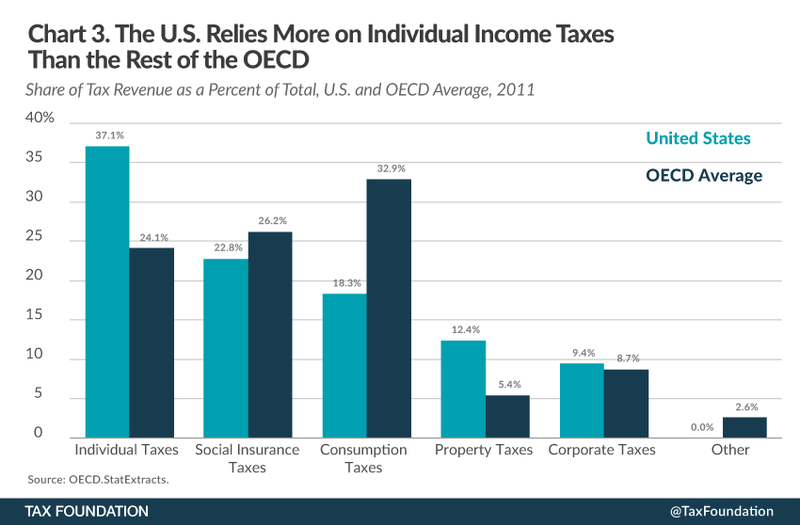 Here we can see that the US favours progressive taxation – in the form of income tax – much more than other countries do on average. In contrast, sales tax is much lower, meaning that the total tax bill for the very poor is much lower in the US. Does this mean the US is a socialist country? Not really, due to the low social benefits and the outcasting of the poor. Instead, it could be that the US is reaffirming its capitalist status here – it’s trying to adjust the market so that the poor can take part in the same economy as everyone else.